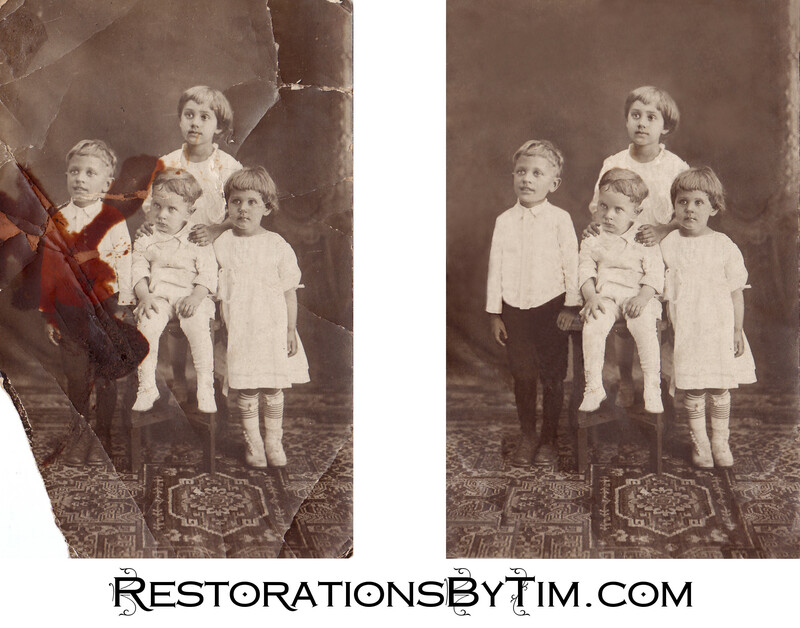 Major Restoration: Optimizing Time and Quality | Photo Restorations by Tim G.
Sometimes a customer may be interested in settling for something passable, rather than perfect, if the customer could thereby save time and money. Although I quoted this request at three hours, I ran into trouble while restoring the standing boy’s left hand, which had been completely obscured by a stain. Instead of piling on the hours, I simply copied the sitting boy’s left hand over and slightly modified it slightly. Although, I spent about four hours on this request, I’d charge the quoted three hours and leave the customer with the option of buying more time to work on the hand. One possible solution would be to photograph a model’s hand and then replace the boy’s hand with that of the model.